What is some of the geological history of Mars? 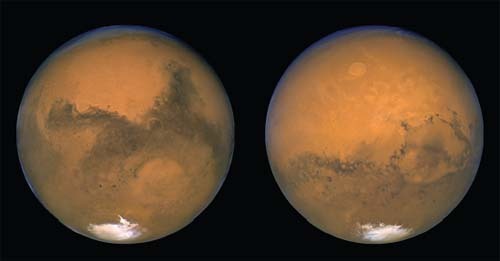 Mars was almost certainly much warmer billions of years ago than it is today. Water may have once flowed across the Martian surface the way rivers and streams flow across Earth’s surface today. There were probably alluvial plains, deltas, lakes, and perhaps even seas and oceans, too. The internal heat under the Martian crust probably powered volcanism and massive magma and lava flows. Furthermore, since the gravitational pull at the Martian surface is about one-third that of Earth’s, volcanic cones and other mountains could be built higher than on Earth, and canyons cut deeper because landslides and erosion would not be as strong an influence.